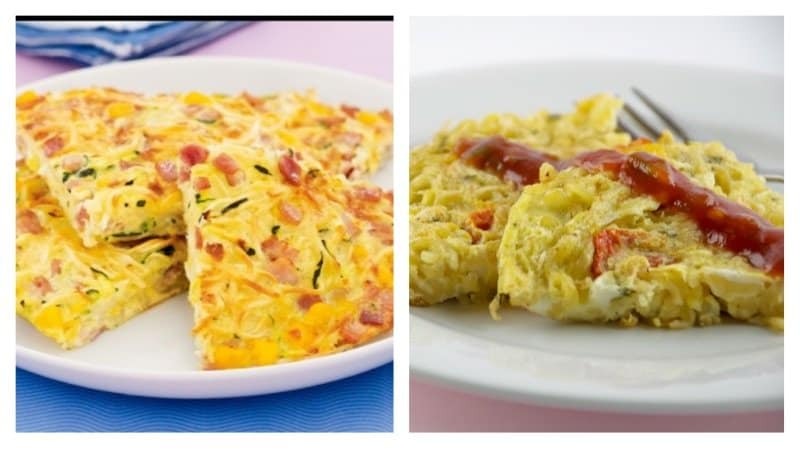 Have you ever thought about incorporating noodles into your breakfast? The Ramen Omelette helps you do just that! Ingredients: 1 pack of instant ramen noodles, 1 tbsp cooking oil, 2 tbsp onion, finely chopped, 1/2 cup cherry tomatoes, halved, 2 tbsp parsley, finely chopped, 2 eggs, beaten with 2 tablespoons of water, a pinch of salt and some Tomato sauce / sweet chilli sauce. Directions: Cook Noodles according to package instructions. Drain the water and toss in the instant powdered stock included in the package. Mix well with a fork. Heat up an 8″ non-stick pan and drizzle cooking oil on it. Quickly stir fry chopped onions over medium heat for 2 minutes till they are translucent and toss in the tomatoes. Cook for another 1 minute. Add the noodles and chopped parsley into the pan and mix well with the other ingredients – cook for another two minutes. Arrange the noodles and tomatoes evenly across the pan. Pour the egg mixture slowly by circular motion starting from the outer edge of the pan. Try to cover all surface. If you can’t, don’t worry. Just swirl the pan around slightly before the egg sets and it will fill up the empty spaces. Lower heat and cook for 4 minutes. Slide a flat spatula under the omelette and quickly flip over and cook some more till both sides are browned. Coleslaw is a tasty side dish to eat with barbecues as well as other home cooked meals. 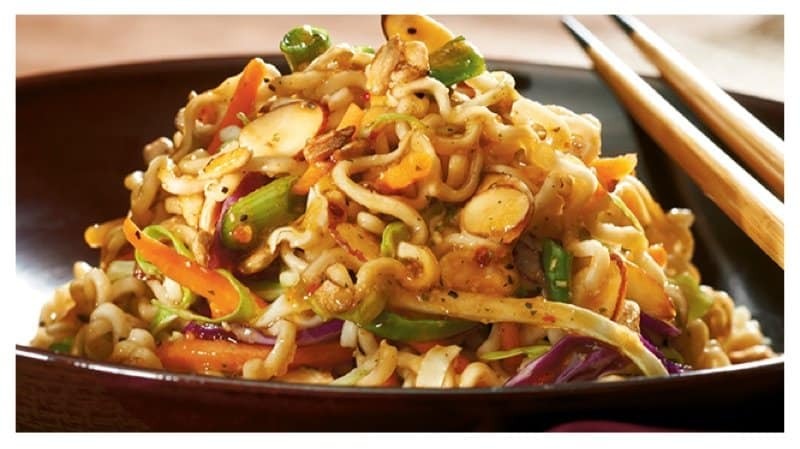 The Asian Ramen Coleslaw is tasty just like the original coleslaw, but with a little twist. Directions: Crumble ramen noodles and combine with green onions, coleslaw mix, sesame seeds and almonds. 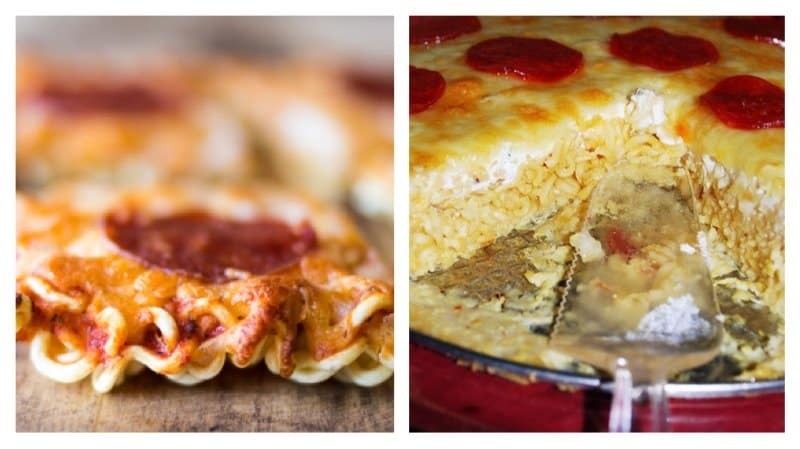 Putting Ramen Noodles into a casserole may sound a bit absurd, but you should consider trying it. This recipe calls for few ingredients and is very easy to make. Ingredients: 4 packages Ramen noodles – one must be beef (reserve ONE beef flavoring packet), one 26 ounce jar spaghetti sauce, 1 lb. cooked ground beef or Italian sausage , 2 cups mozzarella cheese, divided, 3 1/2 cups water. Directions: Break up ramen noodles into a greased 9 x 13 inch pan. They should cover the bottom of the dish. Sprinkle the cooked meat over dry noodles. Pour the jar of sauce over the top. Sprinkle the beef flavor packet over the sauce. 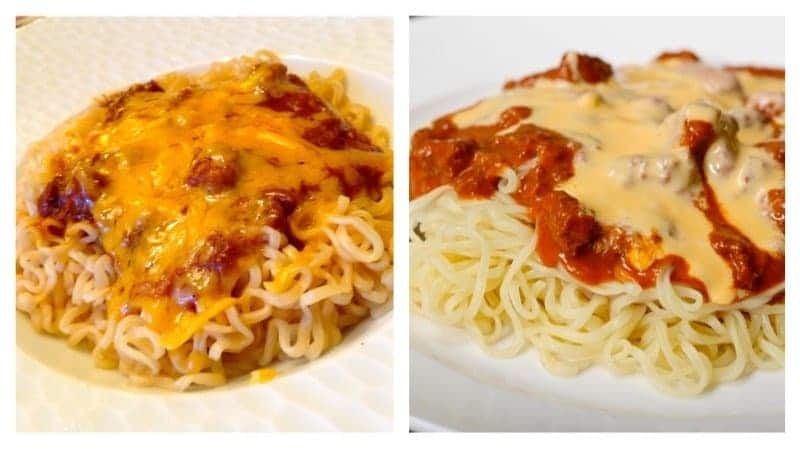 Sprinkle one cup of the cheese over the top of sauce. Gently mix together. Pour the water over the top. Cover tightly with aluminum foil and bake 40 to 50 minutes or until liquid is totally absorbed. Remove from oven and remove foil. Sprinkle the remaining cheese over the top. Return to oven for 5 -10 minutes until the cheese is melted and bubbly. If you’re craving the taste of Ramen Noodles, but aren’t around some water to make them, try this simple and easy hack. Directions: Crunch up the noodles while they’re still in the bag. Open the package, pour the seasoning into the package and shake it up. Eat the noodles as if they were chips. 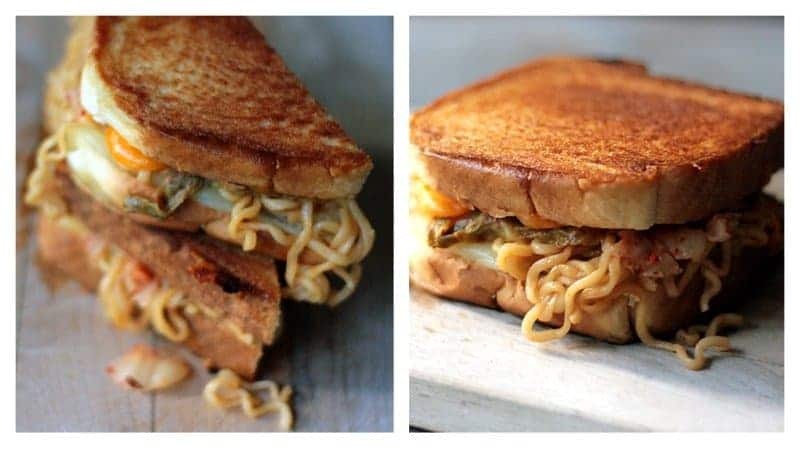 Peanut Butter and Ramen Noodles, together? Yes! 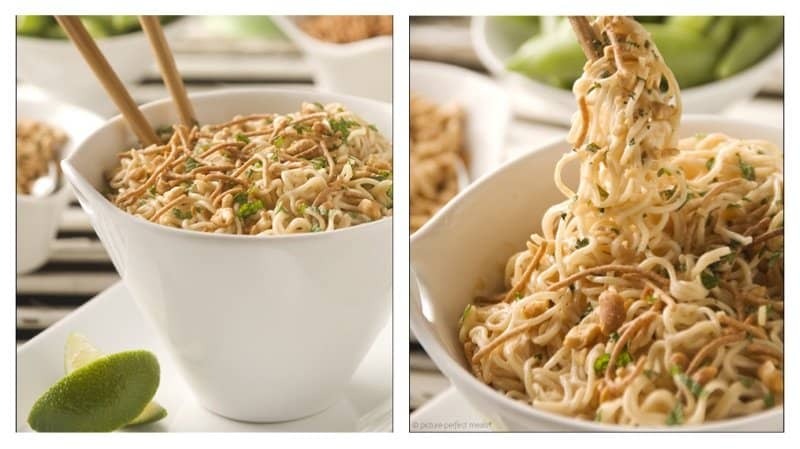 This meal provides the nutty taste of peanut butter mixed with the spices of your favorite noodles. 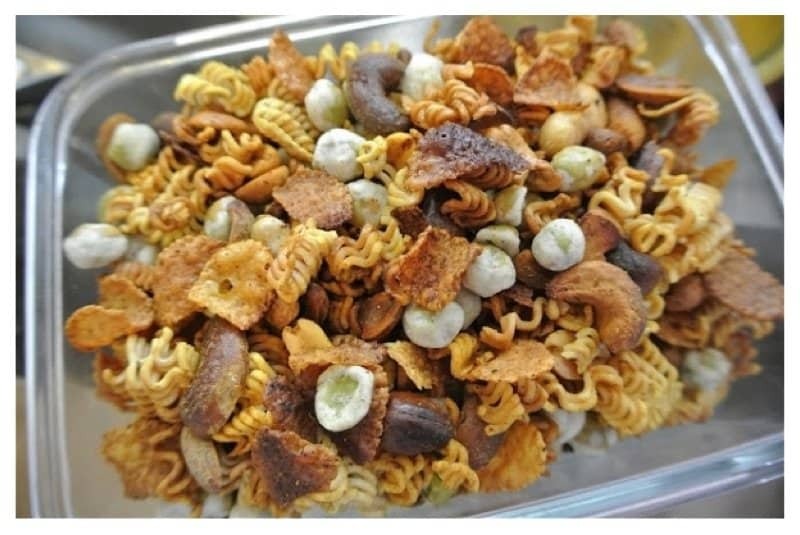 Ingredients: 1 pound curly noodles, 1 tablespoon sesame oil, 2 teaspoons minced garlic, 2 teaspoons minced fresh ginger, 1/2 cup creamy peanut butter, 1 cup light (or unsweetened) coconut milk, 1 tablespoon soy sauce, 1/4 teaspoon red cayenne pepper, 1/2 teaspoon ground cumin, 2 tablespoons lime juice, sugar or honey, to taste, red pepper flakes, to taste. Directions: Prepare the noodles according to the package directions and set aside. In a saucepan over medium, heat the sesame oil; add the garlic and ginger and cook until fragrant, about 1 minute. Add the peanut butter, coconut milk, soy sauce, cayenne, cumin and lime juice. Reduce the heat to medium-low and whisk until the sauce is smooth. Remove the pan from the heat and season to taste with a little sugar or honey and red pepper flakes. Toss with the noodles and serve. Ramepherd’s Pie is a unique twist to the ordinary Shepherd’s pie will all know and love. It’s pretty much that same thing, except it’s topped with noodles. Ingredients and Directions: Start by cooking a half pound of ground beef in a large skillet with a bit of oil. Add a half cup of choped onion along with half of the seasoning packet and a bit of water. Add some frozen peas, season to taste with salt and pepper, then transfer to a pie plate, a gratin dish, or a cast iron skillet. Top with cooked ramen noodles, then broil until brown and crispy on top. These are not your ordinary breakfast pancakes. The Asian Style Noodle Pancakes are a crispy and tangy take on pancakes. Ingredients: 1 package (3 oz. 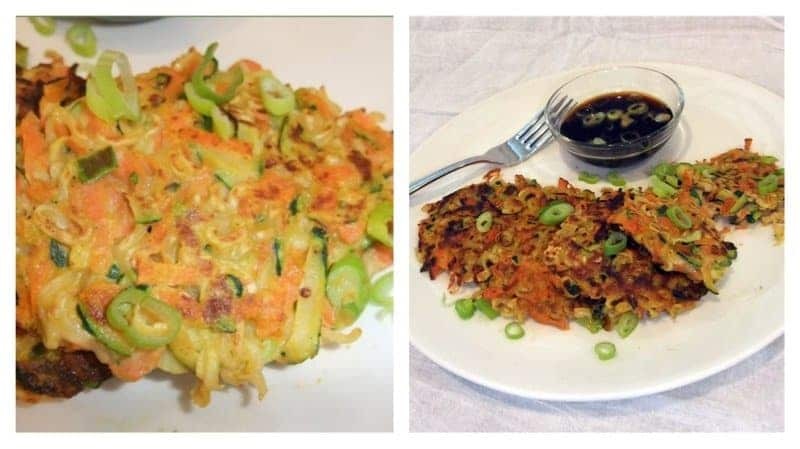 package) ramen noodle soup mix, any flavor, 1 whole zucchini, medium size, shredded, 1 whole carrot, shredded, 2 whole scallions or green onions, thinly sliced, 2 tablespoons flour, 1 tablespoon lemon juice, 2 whole large eggs, beaten, 3 tablespoons vegetable oil, divided, 3 tablespoons soy sauce, 3 tablespoons rice vinegar, 1 pinch red pepper flakes. Directions: Break up the ramen noodles into 4 sections. Reserve the seasoning packet. Cook noodles according to package directions with one exception: boil for 2 minutes only. Drain. Place cooked noodles in a medium mixing bowl, add shredded zucchini and carrot, scallions, flour, lemon juice and seasoning packet. Stir well. Add beaten eggs and mix well. In a nonstick skillet, heat 2 tablespoons oil over medium-high heat. Using a 1/3 cup measuring cup, place noodle mix in the cup and press down lightly with a spoon. Place noodles in the frying pan, press down slightly with a spatula, to help the pancake hold together. Fry 2-3 minutes on each side. Repeat steps using remaining oil as needed. Serve with dipping sauce. For the dipping sauce, mix together soy sauce, vinegar, and red pepper flakes. Almost everyone loves a good taco. With Ramacos, all you have to do is make your tacos like you normally would and add some Ramen Noodles to it. 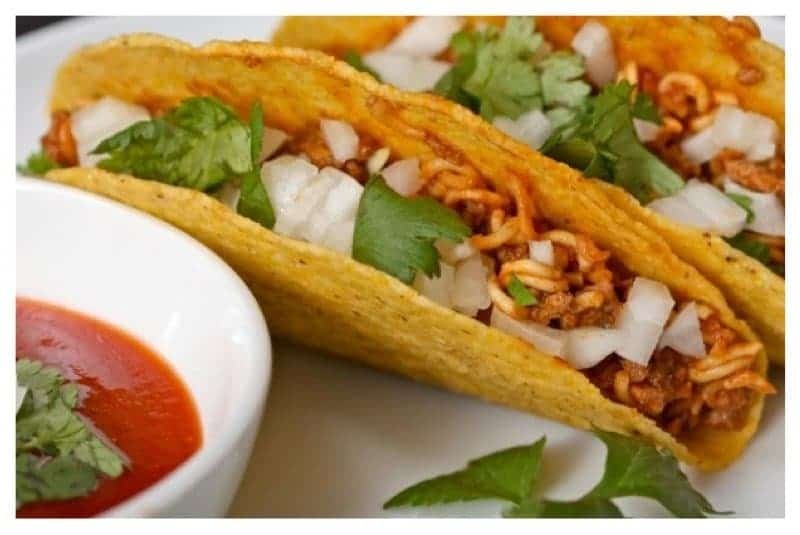 Ingredients and Directions: Use a taco kit that comes with shells, taco sauce, and a seasoning pack. 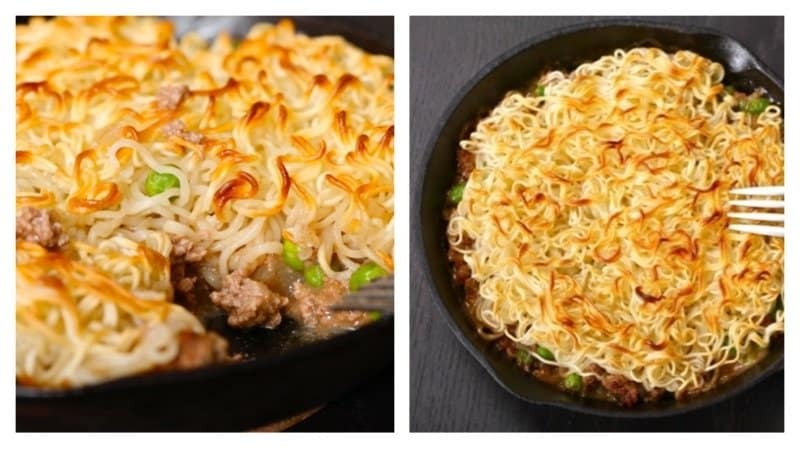 Cook up about half the amount of ground beef recommended on the box, then add a pack of raw crunched-up ramen noodles along with the water and seasoning packet to the skillet. Cook it down until the ramen is the desired texture, adding more water as necessary. Scoop it into taco shells, top as desired. Do you love broccoli salad, but want to add a different crunch to it besides croutons? 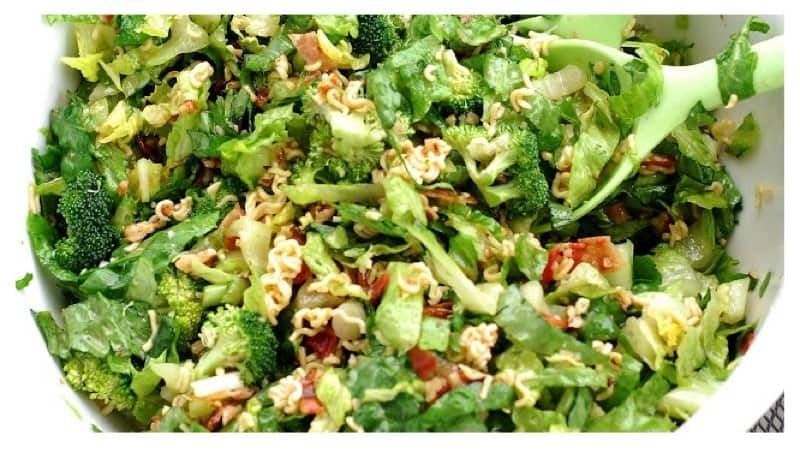 Then you should try this Crunchy Broccoli Salad recipe. Ingredients: 1 head romaine, chopped, 1 bunch green onions, sliced, 1 large head broccoli, cut into small pieces, 1 pound bacon, cooked and cut into small pieces, 2 (3 ounce) packages Ramen noodles, crushed. Discard seasoning packet. 4 Tablespoons butter, melted, 1 cup pecans chopped or sliced almonds. Directions: Mix butter, nuts and crushed noodles. Spread on a cookie sheet and back at 350 degrees until lightly browned, stirring occasionally. About 10 minutes. Set aside to cool completely. Add broccoli, onions, lettuce, bacon and noodle/nut mixture in a large bowl. Toss with dressing right before serving. Did you know that you can create a delicious dessert using noodles? 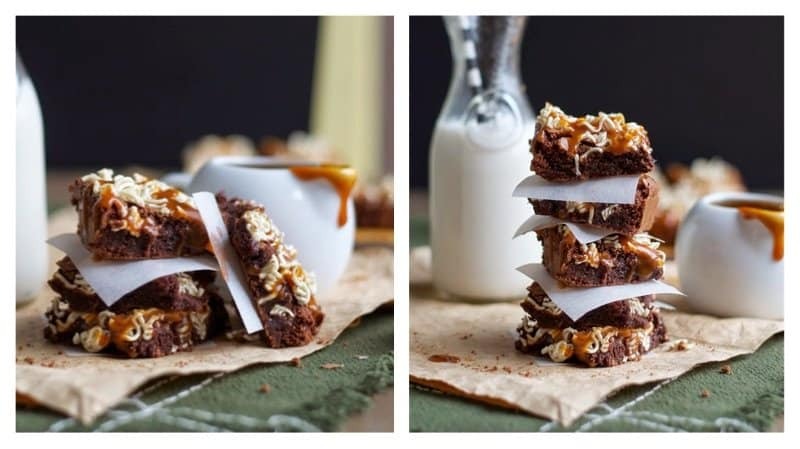 Try this interesting Ramen Brownies With Whiskey Caramel recipe. Ingredients: 8 ounces semisweet or bittersweet chocolate, chopped, 1 stick (4 ounces) butter, 3/4 cup flour, 1/2 teaspoon sea salt, 3 large eggs, 1 1/4 cups granulated sugar, 1 teaspoon pure vanilla extract, 1 package ramen noodles, broken in pieces. Directions: Preheat oven to 350 degrees and prepare a 9×9 baking pan by lining with parchment paper. Leave an overhang at each end to make brownies easier to remove. Melt the chocolate and butter in a double boiler set over simmering water, stirring constantly, until the mixture is smooth and glossy. Set aside to cool a bit. In small bowl, whisk flour and salt to combine. In a medium bowl, use a hand mixer to beat the eggs and sugar until the mixture is pale and thick and when beaters are lifted out of the mixture, it falls in smooth ribbons. Beat in vanilla, then the chocolate mixture until well blended. Using a rubber spatula, fold in the flour mixture until well incorporated and smooth. Pour batter into your prepared pan and smooth out the surface, pushing batter into the corners with a spatula. Scatter the ramen pieces over the surface and gently press into the batter a little. Bake until puffed a little, about 25 minutes. Transfer to a wire rack and cool completely. Caramel: In a medium saucepan, cook the sugar over low heat until melted and browned. Stir it occasionally, but not too much. When the sugar is completely melted, remove pan from heat and add half the cream. It will bub­ble up a lot, so be careful. Stir to incorporate the cream and sugar, then add the remaining cream. Return saucepan to heat and cook, sti­rring con­stantly, until mix­ture reaches measures 230 degrees Fahrenheit on a candy thermometer. Add the but­ter, salt, and whiskey. Stir mixture well, until completely smooth. Strain the sauce through a mesh sieve to catch any crystallized bits of sugar. Let the caramel sauce cool until it’s still pourable but firm enough not to run too much. Drizzle over the brownies. Let the caramel harden up a bit before cutting into squares. Sriracha has become an instant condiment favorite for almost everyone. 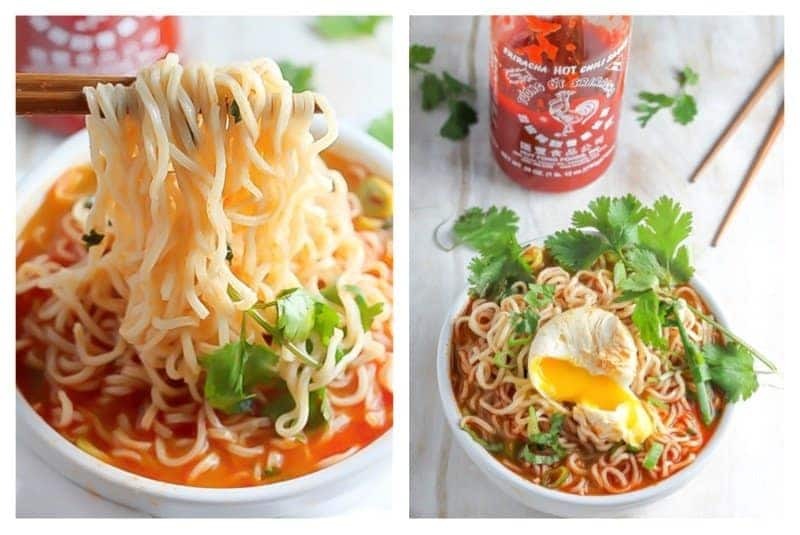 This Spicy Sriracha Ramen Noodle Soup looks delicious and fulfilling. Ingredients: 2 tablespoons sesame oil, 2 tablespoons Sriracha hot sauce, 1 small onion, diced, 1 small roma tomato, diced, 1 tablespoon ginger, grated, 5 cloves garlic, minced, 1/2 teaspoon garlic powder, 1/2 teaspoon celery salt, 4 cups vegetable broth, 2 cups water, 1 tablespoon soy sauce, 1 teaspoon rice vinegar, 3 packages ramen noodles, 1/2 cup scallions, chopped, 1/2 cup cilantro, chopped. Directions: Add the sesame oil and Sriracha to a large stockpot and bring to a simmer over medium-heat. Add the onion and tomato and cook for 4 minutes, stirring occasionally. Add the ginger, garlic, and seasonings; cook for 2 minutes or until fragrant. Add 2 cups of water and transfer mixture to a blender or food processor and pulse until smooth. Return mixture to the pot and add the broth. Bring to a simmer; add soy sauce and vinegar, and simmer for 8-10 minutes. Taste and adjust seasoning as needed. Add the ramen noodles to the broth and simmer for an additional 2-3 minutes, or until the noodles have softened. Add the scallions, stir to combine. Remove pan from heat, ladle soup into bowls, and top with cilantro and eggs. 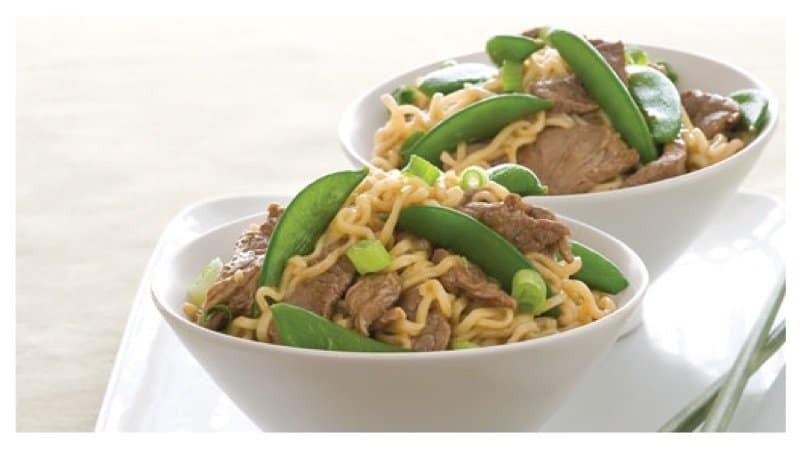 This Sirloin-Snap Pea Stir-Fry recipe is great if you to make your own version of Chinese food at home. It’s actually easier to make than it looks. Directions: Cook ramen noodles as package label directs. Discard flavoring packets. Drain noodles. Boil snap peas for 2 minutes. Drain and rinse with cold water. Warm 1 Tbsp. oil in a skillet over medium-high heat. Add steak, stir-fry for 2 minutes. Transfer to a plate. Add remaining 2 Tbsp. oil to skillet. Stir fry ginger, garlic and scallions for 1 minute. Whisk together broth, soy sauce and cornstarch. Add to skillet; stir-fry for 1 minute. Add peas and steak; stir until hot. Stir in sesame oil. Toss in ramen noodles. Serve hot. A Cleansing Ramen Soup is definitely needed if you’re looking for an easy and tasty way to detox your body. It has all the vegetables needed to maintain a healthy lifestyle. 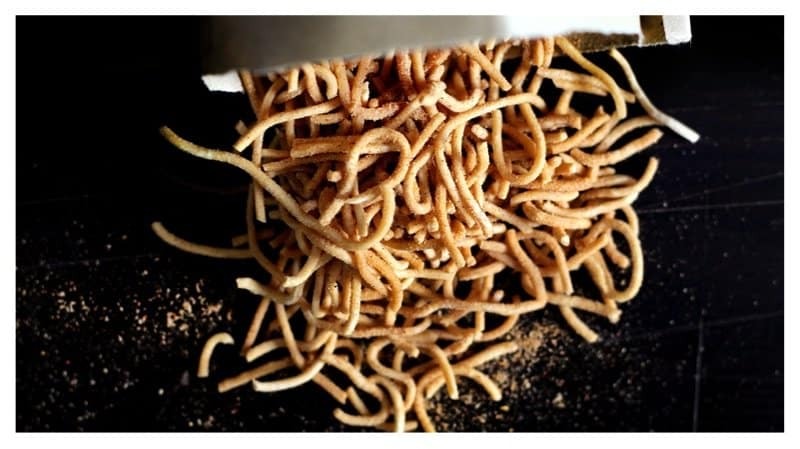 While this doesn’t use the traditional ramen noodles, it allows you to make your own, healthier noodles. Directions: Julienne the zucchini, peels on. Using a julienne peeler or mandolin, peel the zucchinis into noodles and place in a colander over a bowl. Let drip or rest on the counter up to two hours. (leaving uncovered in the fridge accelerates this) The drier they are, the better they stand up to the hot broth. Make the broth. Combine the remaining ingredients (except the thinly sliced carrots & scallion) into a large stock pot. Bring to a rapid boil, then reduce to a simmer for one hour. You can let it simmer longer for a deeper flavor. Strain out the vegetables and return to the pot. Add thinly sliced carrots and return to a boil for 3 to 5 minutes, depending on how cooked you like the carrots. 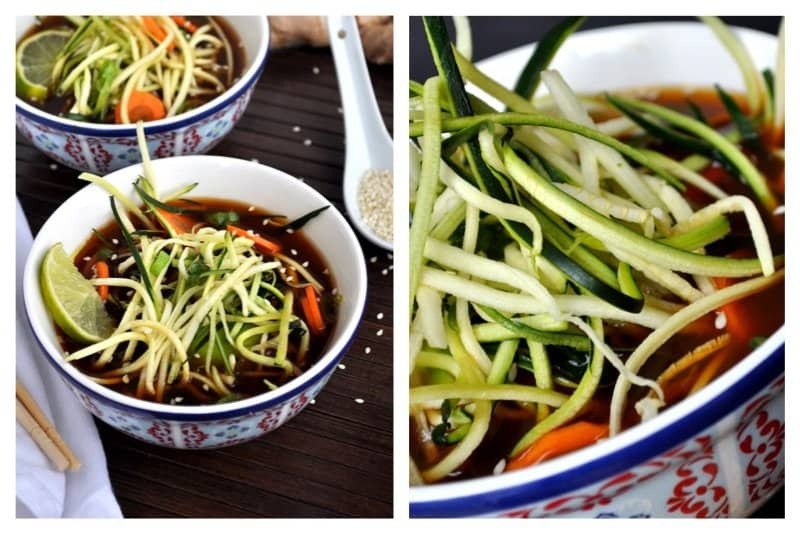 Portion out zucchini noodles into bowls and pour hot broth over. Finish with chopped scallions, fresh lime, cilantro or parsley. This amazing soup recipe is perfect for the whole family. With a few ingredients, you can create something hot and easy to make for dinner. Ingredients: 2 tablespoons peanut oil, 1 pound chicken thighs or breast or a mix, sliced, 1 teaspoon fresh ginger, grated, 1 cloves garlic, minced or grated, 1 sweet potato, chopped, 2 red peppers, thinly sliced, 12 ounces cremini mushrooms, sliced, 1/4 cup thai red curry paste, 2 teaspoons smoked paprika, 1 (14 ounce) can coconut milk, 4 cups low-sodium chicken broth, 1/4 cup reduced sodium soy sauce, 2 tablespoons fish sauce, 1/2 cup creamy peanut butter, 1 lime, juiced, 2 tablespoons brown sugar, 4 packages Ramen noodle soup, seasoning packets discarded. Directions: Heat a large pot over medium high heat. Add 1 tablespoon peanut oil and the chicken. Brown the chicken, stirring once or twice for about 10 minutes or until the chicken is cooked through. Carefully remove the chicken from the pot. Add another tablespoon of peanut oil, the sweet potato and peppers. Cover and cook 8-10 minutes or until the sweet potato is tender. Add the mushroom and cook 5 more minutes. Add in the curry paste and smoked paprika, stirring until the curry paste has coated the veggies. Add 1 cup of chicken broth to a heat safe bowl and microwave on high for 1 minute or until very hot. Carefully stir in the peanut butter until completely smooth. Add the chicken back into the pot along with the coconut milk, remaining chicken broth, soy sauce, fish sauce, peanut butter mixture, lime juice and brown sugar. Stir until the peanut butter has been fully incorporated into the soup. Bring the soup to a boil and then add the ramen noodles and cook for 3-4 minutes. 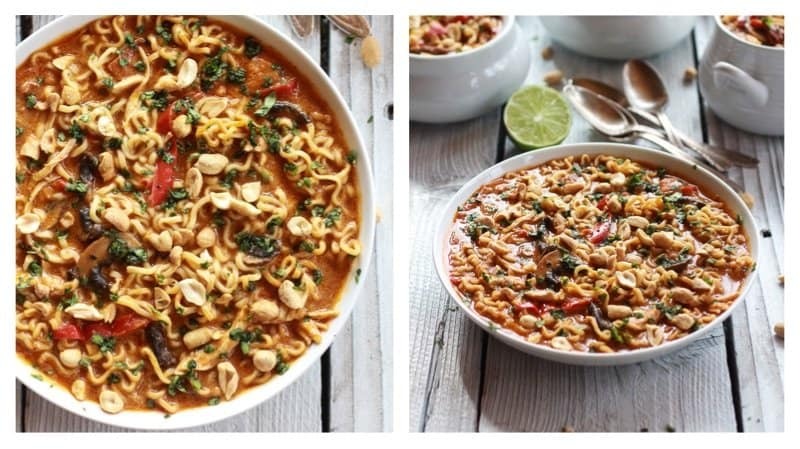 Once the noodles are ready serve soup immediately and garnish with fresh chopped cilantro and peanuts. 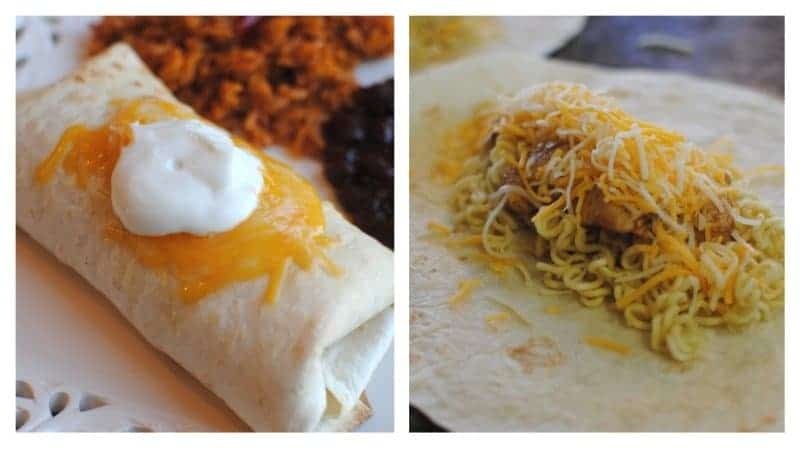 This might not sound too appetizing, but Ramen Noodle Chicken Chimichangas provide an interesting taste to the original Chimichanga meal. You pretty much cook it like the ordinary Chimichangas, and top it off with sour cream and your favorite side dishes. Ingredients: 4 flour tortillas, 4 fresh chicken tenders, cut into bite-size pieces, 1 pkg chicken flavored ramen noodles, 1 tbsp olive oil, 1 tsp minced garlic, 1/2 tbsp chili powder, 8 tbsp shredded cheddar cheese, and cooking oil. Directions: Preheat oven to 350 degrees. Cook Ramen Noodles according to the package directions. Drain all liquid from the noodles and set aside. On each tortilla place 1/4 of the Ramen noodles, 1/4 of the to chicken, and 2 tbsp shredded cheese. Roll up into chimichangas and place seam side down on a greased baking sheet. Spray tops with cooking spray and bake for 10-15 minutes until browned and crunchy. Everybody loves Mac & Cheese! This Ramac & Cheese recipe provides a crunchy topping to your favorite side dish. Ingredients and Directions: Use a half block of Velveeta mixed with some milk and butter. 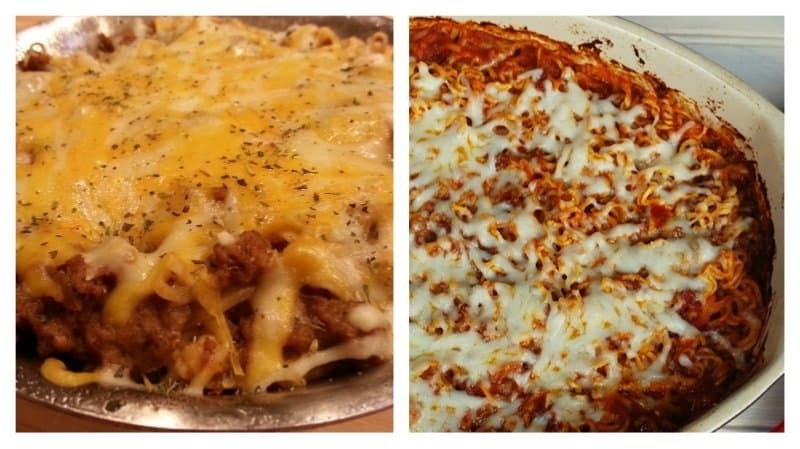 Heat it up in the microwave until gooey and cheesy. 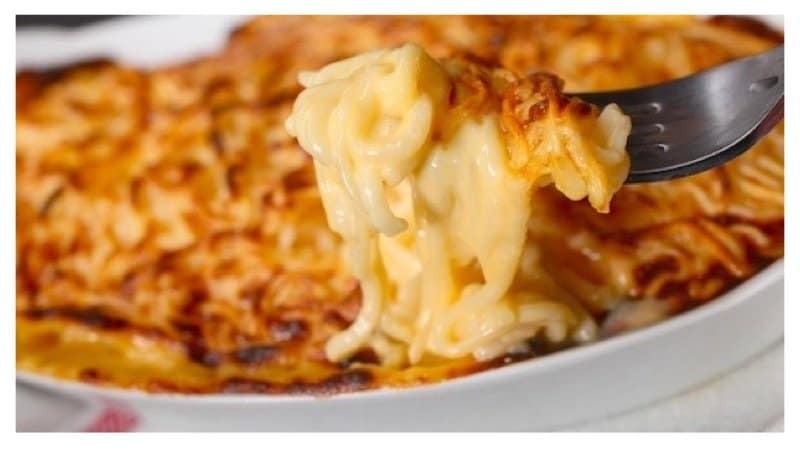 Combine the cooked noodles with the cheese sauce, top with more cheese, and broil until brown and bubbly.